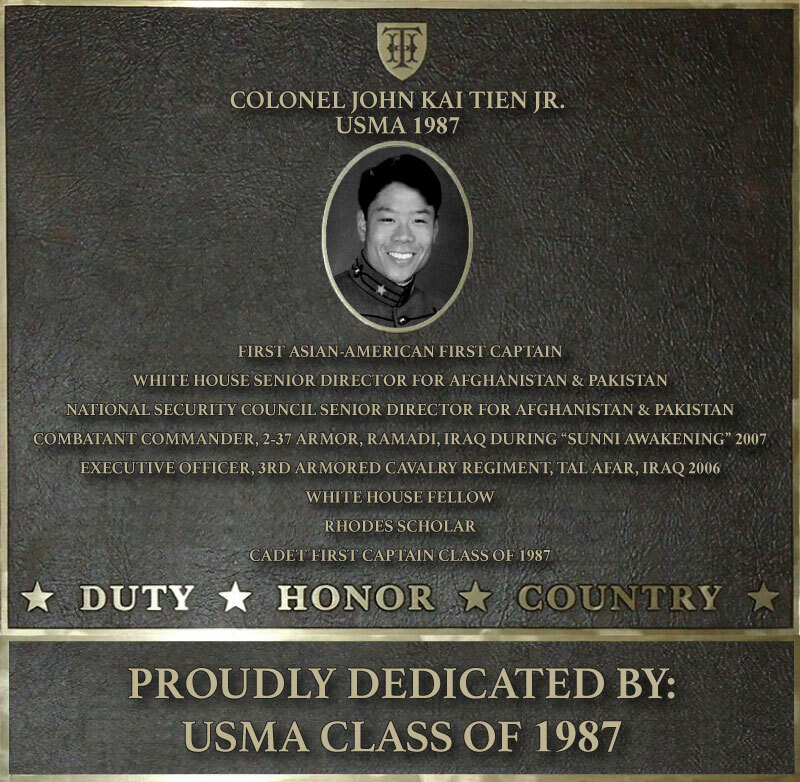 COLONEL JOHN KAI TIEN JR.
John Tien, the first Asian-American Cadet First Captain in West Point’s 200-year history, is a Rhodes Scholar, three-time combat veteran in Iraq, and a former White House national security advisor, and now serves as a managing director for Citi Retail Services. Tien, 52, graduated from West Point in 1987. His active duty military career spanned 24 years. He joined the global bank Citi in 2011 and has held a number of leadership roles. In addition to his current position with Citi Retail Services, he is the national co-head of the Citi Salutes program. Citi Salutes works with national and local organizations on critical issues such as housing, entrepreneurship, financial resilience and employment for veterans and active military members and their families. He also is chairman of the board for the military veterans non-profit The Mission Continues. “I feel so honored to have been recognized with this room dedication, and I’m humbled to follow in the footsteps of some of the most distinguished graduates of the United States Military Academy,” said Tien. “While I no longer directly lead our military men and women in uniform, I do feel like I am still able to serve them through my work with Citi’s veterans-related community-support efforts, the Veterans on Wall Street organization, and in my role as the board chair of the veterans non-profit, The Mission Continues." Tien’s military awards and decorations include the General Douglas MacArthur Leadership Award, the Presidential Unit Citation, Bronze Star Medal, and Combat Action Badge. He holds a Bachelor of Science degree from the United States Military Academy located at West Point, and a Master of Arts degree from Oxford University, where he was a Rhodes Scholar. With his wife, Tracy, he is a senior advisor to the national military family non-profit, The Children of Fallen Patriots Foundation. John and Tracy reside in Atlanta and have two college-age daughters.